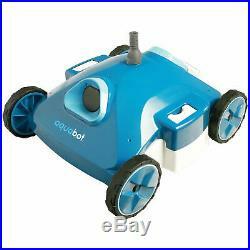 Aquabot Rover S2-40 AJET121 Above Ground Robotic Auto Pool Cleaner (Open Box). Designed to clean residential above ground pools of all sizes and surfaces. 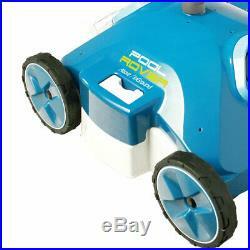 Ideal for cleaning figure-8, Grecian, kidney, l-shaped, oval or round, and rectangle shaped pools. Excellent at cleaning vinyl, Gunite, concrete, tile, and fiberglass pool surfaces. Cleans: floor, cove, and partial wall. Innovative Design - The sleeker design allows for the maximum maneuvering through your pool and allows you to enjoy your pool instead of worrying about it. Top cover access to filter. Improved tread that allows better traction. New and easy to use power supply. Shape: rectangle, lap, kidney, l-shape, round, oval. Surfaces: vinyl, Gunite, concrete, fiberglass, tile. Pool to wall transition: curved. 1 and 2 hour timer settings. Top loading fine filter bag (2 microns). 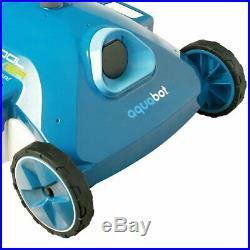 Don't miss out on this great pool cleaner from Aquabot! Equipped with the NeverStuck System. 1 and 2 hour cleaning cycle times. Top Loading Fine Filter Bag (2 Microns). Features: Multi-setting, multi-terrain, Neverstuck system. We believe in clean water. We believe in helping you protect your family. Knowing that the water you swim in is as pure and as close to nature as it can be. We like soft skin, opening our eyes underwater and tea parties at the bottom of the pool. We believe that water starts pure. We believe that water should remain pure. We are the Keepers of Pure. Cancelling Your Order: &###xA0;Your order is important to us and will be processed immediately. Select the reason for the return. This listing is currently undergoing maintenance, we apologise for any inconvenience caused. 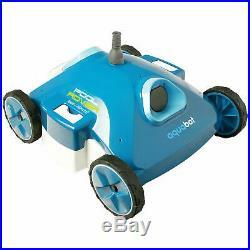 The item "Aquabot Rover S2-40 AJET121 Above Ground Robotic Auto Pool Cleaner (Open Box)" is in sale since Thursday, March 7, 2019. This item is in the category "Home & Garden\Yard, Garden & Outdoor Living\Pools & Spas\Pool Cleaning Tools\Pool Cleaners & Vacuums". The seller is "vm-express" and is located in Lincoln, Nebraska. This item can be shipped to United States, Canada, United Kingdom, China, Mexico, Germany, Japan, Brazil, France, Australia, Denmark, Romania, Slovakia, Bulgaria, Czech republic, Finland, Hungary, Latvia, Lithuania, Malta, Estonia, Greece, Portugal, Cyprus, Slovenia, Sweden, South Korea, Taiwan, Thailand, Belgium, Hong Kong, Ireland, Netherlands, Poland, Spain, Italy, Austria, Bahamas, Israel, New Zealand, Philippines, Singapore, Switzerland, Norway, United arab emirates, Qatar, Kuwait, Bahrain, Croatia, Malaysia, Chile, Colombia, Costa rica, Panama, Antigua and barbuda, Aruba, Belize, Saint kitts and nevis, Barbados, Brunei darussalam, Bolivia, Ecuador, Egypt, Gibraltar, Guadeloupe, Jordan, Cambodia, Cayman islands, Sri lanka, Paraguay, Reunion, Viet nam, Uruguay.